​there is no longer male and female; for all of you are one." Our Denomination, the United Church of Christ (UCC), came into being in 1957, from the merger of the Evangelical and Reformed churches and the Congregational Christian churches. Today the UCC is made up of more than 5,000 churches and nearly a million members. The UCC is a liberal Christian denomination with a long history of supporting justice. It was the first mainline Christian denomination to ordain an African American minister (1785), a woman minister (1853), and an openly homosexual minister (1972). ​The UCC motto, "That they may all be one," speaks to the hope that one day all denominations, if not all faith traditions, will either come together as one, and respect one another. 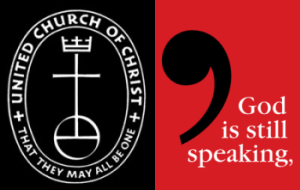 The UCC slogans, "God is still speaking," and "Never place a period where God has placed a comma," (a quote from comedian and Catholic Gracie Allen) demonstrate an understanding of the continuing unfolding of God's revelation. And the UCC statement, "No matter who you are or where you are on life's journey, you are welcome here," shows that our denomination believes in extravagant hospitality.